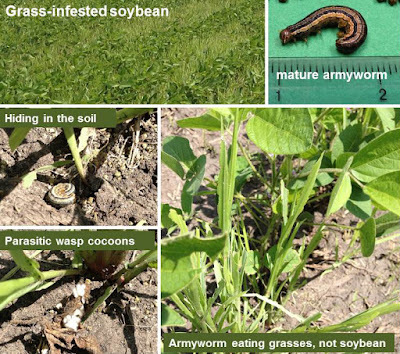 Reports are beginning to come in on armyworm activity in Minnesota, particularly central and now in the northwest. Scouting for armyworm should make it on the to-do list. Most of the initial damage reports came from Bruce Potter, IPM Specialist located in Lamberton, MN (SW Research and Outreach Center). He has received calls from the central part of the state (for example, St. Cloud, Sibley Co., Wadena area). Using rye as a cover crop was a common factor in these fields. In one field where alfalfa was seeded into rye, armyworms defoliated alfalfa after the rye was killed, then marched off to nearby corn. Here are some images illustrating preference for grasses. 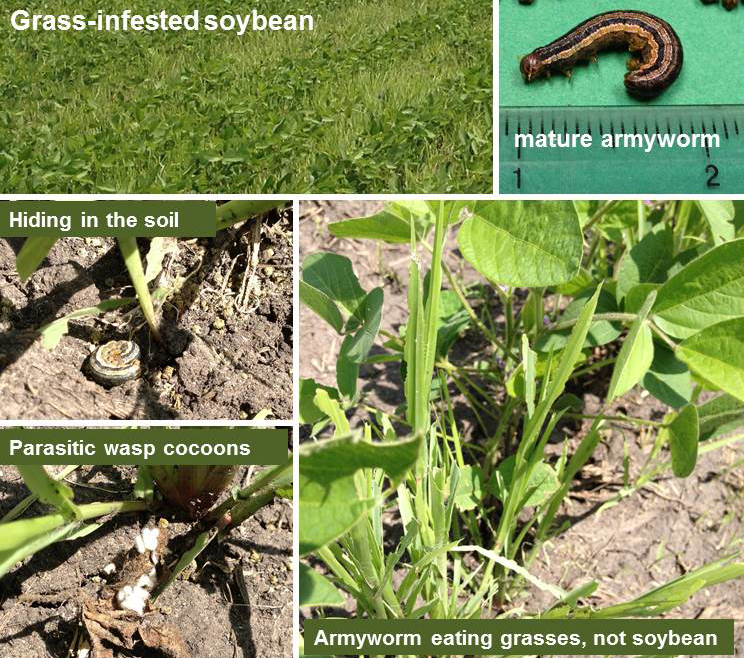 These pictures were taken in a soybean field was infested with foxtail. 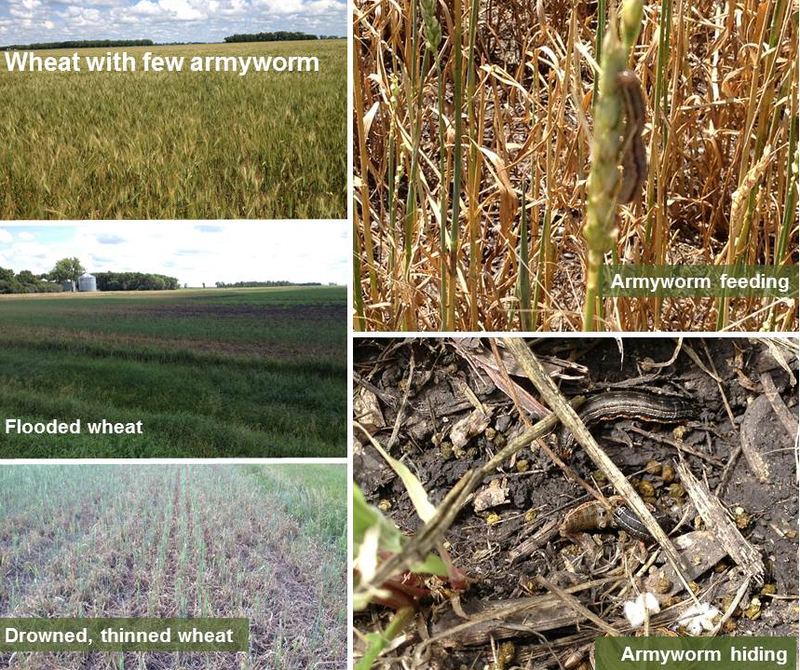 Northwest Minnesota has now had additional reports of armyworm. In these cases it has been in the small grain crops. Recent storm events help move the moths into the area. The driving wind and rains produce lodging which is attractive to the moths for egg laying and helping with larval survival. Here are some photos from several years ago where wheat was infested in northwest MN and illustrate what you might see when scouting small grains. Keep in mind, Armyworm moths are migratory and problems could be in other areas also. Focus on fields where storms occurred and lodging is present. Larger larvae may indicate an earlier migration event. Smaller larvae indicate a more recent migration. Hopefully this is a problem affecting relatively few fields. 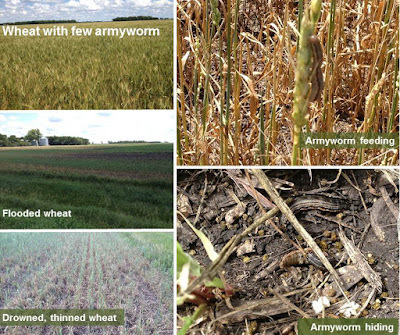 The damaging period of an armyworm outbreak is dramatic but relatively short in duration. Before applying an insecticide, make sure armyworms are still present and feeding. They are most active in the evening, so when scouting a field during the day, be sure to look for larvae at the base of plants and beneath dirt clods or in soil cracks. Locating larvae will help determine their ages based on size. We have found larger (1 1/4") and smaller (<1/2"). Scouting can also indicate the level of parasitism that is occurring. Look for the cottony cocoons of the parasite attached to or near armyworm cadavers (see photo above). Parasitism can be quite high. The recommended treatment threshold in small grains is 4 to 5+ larvae per square foot. The threshold in corn is when 25% to 30% of the plants have 2 or more worms or 75% of the plants have 1 worm. For Migrating Armyworms: Treat a couple of swaths ahead of the infestation in the direction of movement to form a barrier strip. If an insecticide is warranted, be aware of the Post Harvest Intervals for the insecticide you choose.